After a few days in chilled-out El Chaltén we did a three hour bus journey to El Calafate, the jumping off point for the southern areas of the national park. After checking into the YHA hostel (boy, have hostels changed – towels and sheets provided) we had a look around the town and found some liquid refreshment as it was beer o’clock. It had been suggested to us that we visit Laguna Nimez on the lake if we were interested in seeing some bird life. Laguna Nimez is a wetland on the edge of Lago Argentina and when the waters rise, the two bodies of water actually merge. Lago Argentina is enormous and has lovely turquoise water. The Laguna is much smaller and has some boardwalks and trails around its edge, allowing you to see the birds in their habitat. Being spring, there were a few chicks around and we saw a family of Couquén Común. The long-necked father honked when we approached and mother and chicks scurried into the water and paddled away. Also present on the day was a flock of about 19 Chilean flamingos! They were a fair distance away near an island in the lagoon, but were instantly recognizable by their bright pink colour. It was an odd sight spotting these lanky creatures with the background of snow capped Andes mountains in the distance! The big site that people come here for is really the Perito Moreno Glacier and we did get there. And it is big. Like 60 meters high sort of big. Think 20 story high building big. We travelled by bus the 80 kilometers to the glacier through beautiful but dry, scrubby estancia country where there were few animals roaming and hardly any buildings. The bus makes a coffee and restroom stop at an estancia that has diversified into an agiturismo business and acts as the roadside cafe. Here we got to see a baby grey fox that had been rescued a few months before. It was happily playing with a local kitten and seemed to be quite content as we left. 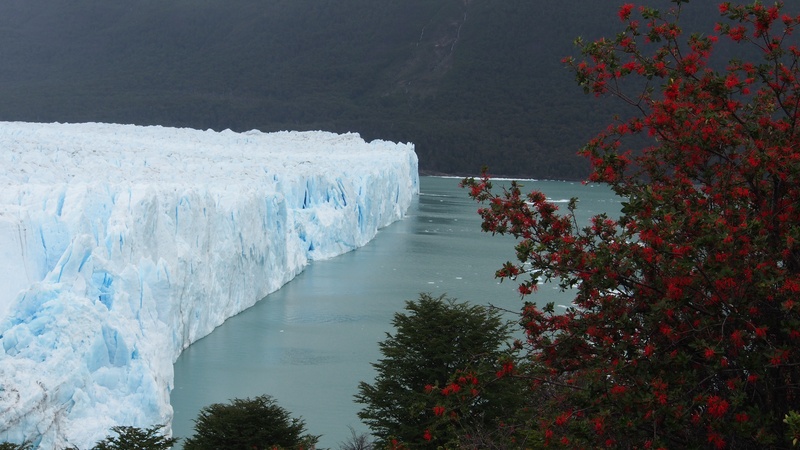 Perito Moreno is one of the few glaciers in the world that is actually advancing. It reaches across the channel towards the Magallenes Peninsula and can be viewed from a series of steel walkways on the peninsula side. Every few minutes you hear a rumble and another chunk of ice drops into the water. Often by the time you hear the sound, it’s too late to see anything. You just see the ripple on the water and maybe a bobbing iceberg. There is also the option to board a boat that takes you closer to the glacier, so we did it. The perspective from the water was worth it as you could look up at the glacier and see closer into some of the shadows. The blue colors reflecting off the ice are quite stunning and change as the weather goes from mist to grey cloud to bright sun. At the bottom of this post I have included a few photos of the days we spent in this area and I hope they enhance your appreciation of this region of Argentina. We are currently 3 hours into a 6 hour bus ride to Puerto Natales, Chile. Tomorrow we begin 3 days of camping and hiking inside Torres Del Paine National Park. See you when we next have wifi! This entry was posted in travel and tagged Argentina, El Calafate, Glacier, Patagonia, Perito Moreno, Perito Moreno Glacier. Bookmark the permalink. Sorry folks, I am no longer updating this blog, as it was intended for our trip to south America in 2014. But have a read anyway.